The interent has come a very long way since it’s humble beginnings. So much so that it is now by far the number 1 way to promote a business, product, service, band, sports team….. I could go on. Although a few years ago the only true way to get a good website that will promote your cause was to go to a web design company and pay a handsome fee, though now you’ll be please to know that now professional and powerful websites can be crafted by your own hand for very affordable costs. Now Im not talking web builders that bombard our TVs with million pound + adverts. I won’t mention their names as I’m not a fan and they certainly don’t do what it says on the tin. No I am talking about a little bit of opensource gold in the form of WordPress. For those of you that don’t know WordPress is a CMS (Content Management System) that provides the use with a powerful platform to power a their website. Enabling you to update it, add new pages, run a news / blog section and other great features. WordPress is a theme based CMS which will control how the front of your website looks and its easy to buy a custom theme for as little as £25. Below is a list of the best websites to get WordPress themes. *Note. You will need a domain and web hosting to house your website. 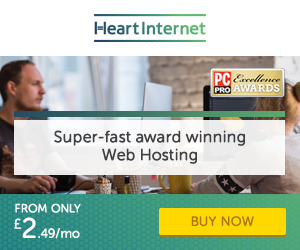 I use Heart Internet for all my sites which have served me very well over the last 4 years. In my opinion ThemeForest is the top site for WordPress themes, not just due to the sheer number of themes they offer (with new ones being added everyday) but also the quality of each theme. That pretty much concludes this post. I hope you have found it useful. If you have please give it a share on your favorite social media.